BODOM is a Don Films project that has been gaining decent amount of attention since the beginning. There is clearly some viral potential here. The nightmarish real events at Lake Bodom in 1960 make up a chilling background for the story. If you’ve never heard of it, I recommend reading this Reddit discussion. It is probably reasonable to point out that the BODOM movie is set in present day, and tells an original story set at the notorious lake. Castingwise, the movie is a bit of an odd ball. Main roles will be played by the Finnish rapper Mikael Gabriel, a World-Cup-level cheerleader Nelly Hirst-Gee and the fresh young actors Mimosa Willamo and Santeri Mäntylä. Willamo is probably the most experienced and definitely the most acclaimed of the pack, having made her feature debut last year in the mediocre social drama Päin Seinää, earning her a Jussi-award (the Finnish equivalent for a BAFTA or an Oscar) for the best female supporting role. However, with young actors, much will be resting on the director Taneli Mustonen. There aren’t too many slasher movies from Finland, Kuutamosonaatti probably being the closest one. Therefore, I’m totally excited to see this one finally coming together. 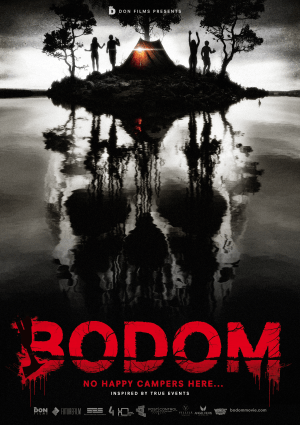 Funny fact is, there is also a Hungarian found footage horror production from 2014, called Bodom. I’ve never seen it, so if you have, please tell me is it worth checking out. One thing I must say, the weirdest thing. Somehow, there’s something wrong here and I just can’t put my finger on it. Maybe it’s the neat stylishness of the trailer, the casting choices or the subject matter itself. I just don’t know. Nonetheless, I wanna be a good sport and play along, or in Fox Mulder’s words, I want to believe. I want to believe in the filmmaker’s sense of style and knowledge of the genre. I want to believe Lake Bodom hasn’t yet shown what color its waters really are. BODOM will be out this fall.